Bodhi makes connecting to the internet or your local network easy with the use of Network Manager (nm-applet). All you have to do is left-click on it. Then choose the type of connection from the available list. Network Manager is capable of managing many types of network connections, including ethernet, mobile broadband, wireless, VPN and DSL. Many connections will be configured automatically; some will need input from the user, such as a password. After a few moments, a connection should be established. 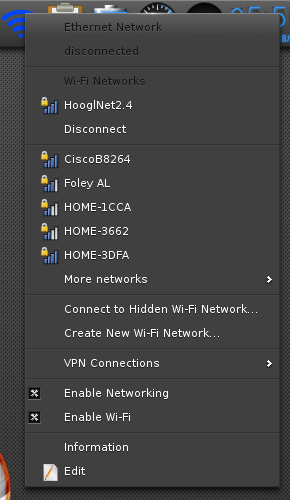 Connections can then be edited by clicking on the icon, selecting Network Manager, then Edit to open the settings manager. Also, notice the icon changes its appearance once a connection is established. A common feature that is enabled automatically is to have the connection in question automatically connect as soon as it is detected. Connection problems can be notoriously difficult to diagnose, especially on a system that is not able to make a connection at all. If these steps fail, the best advice we can give is to get on a system that does make a connection (or use a wired connection if wireless is failing) and join us on IRC or the Bodhi Forums. Also see the Resources Page.